It’s May and spring is transitioning into summer. I’m glad that the Tuesdays with Dorie group decided on the Springtime Cookies and Curd and Double-Butter Double-Baked Petit Beurre Cookies as recipes to bake this month. The cookies are nice and buttery with a nice cripsness to them, and the strawberries and citrus curd are incredibly delicious together. The first element I worked on was the citrus curd with grapefruit and lemon juices. I was afraid that I messed up my curd because it was pretty runny. My fears quickly disappeared when I re-read what Dorie wrote: the curd will thicken but will always be pourable rather than spreadable, and that’s just right. I love when Dorie leaves those helpful tidbits. The Double-Butter Double-Baked Petit Beurre Cookies was the next element I took on. This recipe took me two days to put together, but only because I started working on this pretty late at night. When I first read through this recipe, I had no idea where it was going. I was on board with making and baking streusel-like dough, but the next step threw me off completely: putting the baked streusel back into my mixer with butter and then rolling it out. I couldn’t picture this in my head, but it made sense when doing it. Next, I chilled the rolled dough overnight and chomped out circles the next day and baked them. My first batch burned. My cookies burned badly. I left them in the oven for 14 minutes (rotating them halfway through) as instructed. I had to adjust my bake time to only 10 minutes (rotating halfway through), adding a note to my future self to check on the cookies after 9 minutes. Overall, this was quite a timestaking project, but the end product was delicious! The curd had a nice brightness to it, which was complemented by the sweetness of the macerated strawberries. The soft textures were contrasted by the crunchiness and crumbliness of the cookies. 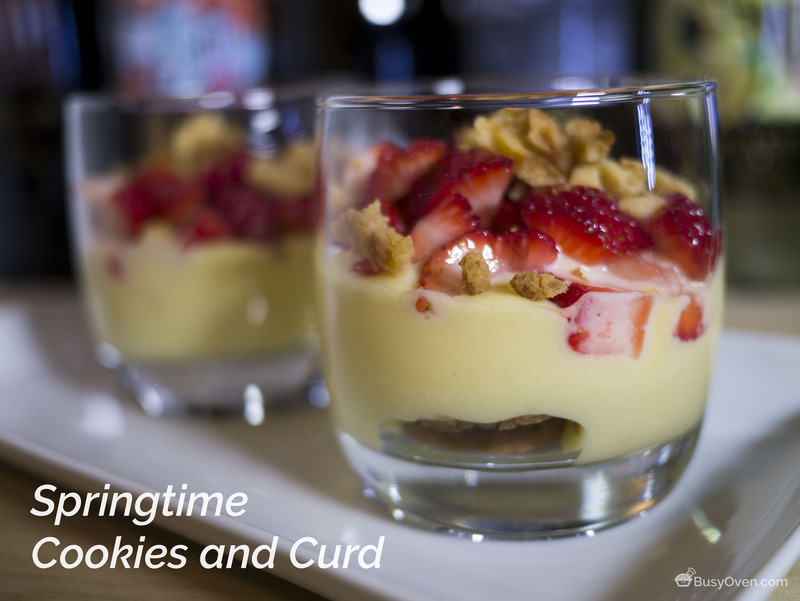 This Springtime Cookies and Curd recipe was a delightful one that I would gladly make again. Springtime Cookies and Curd recipe is on page 384 of Baking Chez Moi by Dorie Greenspan. Yes, it was delicious, but definitely a project. Yours looks marvellous. I’ve only made the cookie part of this but it’s delicious already (though, yes, very time consuming!). Yours looks great! It looks so pretty as a layered dessert. The cookie method was definitely unusual; I wasn’t quite sure how it would work out until I actually did it. I love when Dorie’s extra little comments help too! Your final product looks fantastic! I agree, these cookies were an adventure and one I wasn’t thinking I would re-do until I tasted them in the second recipe. That really was a delicious one! I am glad these were a hit for you. I think I will serve them like you did in a dessert cup. Sounds like I need to plan ahead for this one.